Over the past two weeks, 3 RIASA Student-Athlete’s have played at professional UK clubs, York City F.C., and Falkirk F.C. Following standout performances in the recent RIASA Showcase games against Sheffield Wednesday and Athelite Sports Agency (ASA), at which numerous club representatives were in attendance, Chase Boone, Adam Szymasek, and Paul McFarlane were immediately requested to come and train and play with York City F.C. and Falkirk F.C. We recently caught up with Boone (York City F.C./Falkirk F.C. ), Szymasek and McFarlane (Both at Falkirk F.C.) to talk about the incredible opportunities that they have earned. Since the games that the Student-Athlete’s played, Chase has been invited back to York City F.C., Paul has been invited back to Falkirk F.C. and Adam has been picked up by Sunderland to train and play in a game against Celtic F.C. 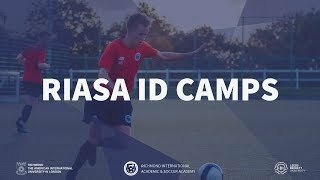 Congratulations to the three RIASA Student-Athletes!